This animation helps explain the dynamics of subglacial water exchange and how it is observed from space. It begins with a satellite image of the study area, followed by an artist’s concept of the Antarctic surface. The animation then moves down to a cross section of the ice sheet with lakes hidden deep beneath. As pressure is exerted on one lake, its water is forced to an adjacent lake, resulting in elevation changes at the surface over both lakes. Animation courtesy of NASA. The San Diego Supercomputer Center (SDSC) and Scripps Institution of Oceanography at the University of California San Diego have been awarded a NASA ACCESS grant to develop a cyberinfrastructure platform for discovery, access, and visualization of data from NASA’s ICESat and upcoming ICESat-2 laser altimeter missions. ICESat and ICESat-2 (scheduled for launch in 2018) measure changes in the volume of Earth’s ice sheets, sea-ice thickness, sea-level height, the structure of forest and brushland canopies, and the distribution of clouds and aerosols. The new project, dubbed “OpenAltimetry” (www.openaltimetry.org), will build upon technology that SDSC developed for its NSF-funded OpenTopography facility, which provides web-based access to high-resolution topographic data and processing tools for a broad spectrum of research communities. OpenAltimetry, which includes the Boulder, CO-based National Snow and Ice Data Center (NSIDC) and UNAVCO as collaborators, also incorporates lessons learned from a prototype data discovery interface that was developed under NASA’s Lidar Access System project, a collaboration between UNAVCO, SDSC, NASA’s Goddard Space Flight Center, and NSIDC. (Top left) ICESat 91-day tracks across newly discovered subglacial Lake Engelhardt in West Antarctica. Tracks are color-coded by elevation changes between October 2003 and November 2005. White asterisks locate tide-induced ice-flexure limits for the grounding line derived from ICESat repeat-track analysis. 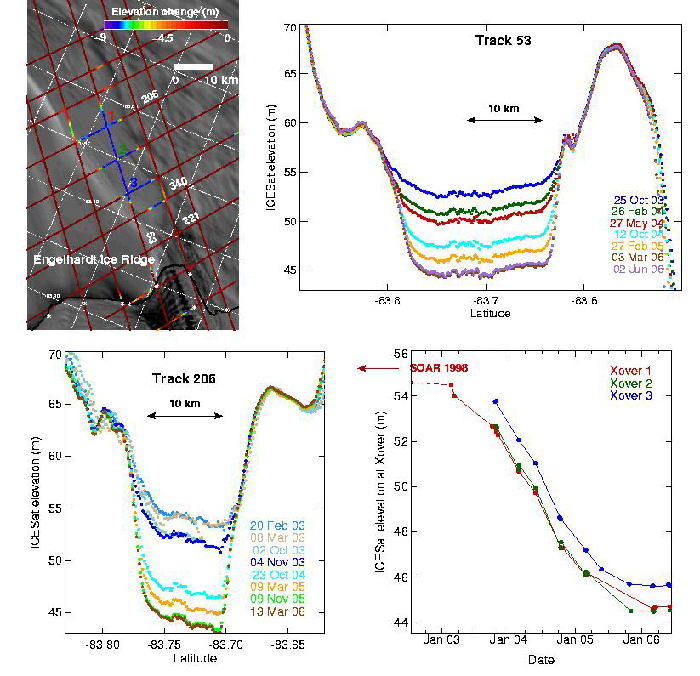 (Top right/bottom left) Repeat ICESat profiles along two tracks across the lake (see top left panel for locations). Track 206 was an almost exact repeat of an 8-day track. (Bottom right) ICESat elevations against time at three orbit crossovers in the center of the lake including the 8-day data at crossover 1 in February/March 2003. Image courtesy of Fricker, Helen Amanda; Ted Scambos; Robert Bindschadler; Laurie Padman: “An Active Subglacial Water System in West Antarctica Mapped from Space.” Science 315, no. 5818 (2007): 1544-1548. OpenAltimetry will enable researchers unfamiliar with ICESat/ICESat-2 data to easily navigate the dataset and plot elevation changes over time in any area of interest. These capabilities will be heavily used for assessing the quality of data in regions of interest, and for exploratory analysis of areas of potential but unconfirmed surface change. Possible use cases include the identification of subglacial lakes in the Antarctic, and the documentation of deforestation via observations of forest canopy height and density changes. The OpenAltimetry cyberinfrastructure will include a web-based map interface for easy data discovery, with additional visualization and quality control tools that will make the interface a valuable resource for ICESat experts. Working behind the scenes will be a highly scalable data management platform with tiered storage, system-wide usage monitoring, application program interfaces (APIs) for programmatic access for expert users and interoperability with other systems. “OpenTopography has demonstrated that enabling online access to data and processing tools via easy-to-use interfaces can significantly increase data use across a wide range of communities in academia and industry, and can facilitate new research breakthroughs,” said Viswanath Nandigam, associate director for SDSC’s Advanced Cyberinfrastructure Development Lab. Nandigam also is the principal investigator for the OpenTopography project and co-PI of OpenAltimetry. On a broader scale, the OpenAltimetry project addresses the primary objective of NASA’s ACCESS (Advancing Collaborative Connections for Earth System Science) program, which is to improve data discovery, accessibility, and usability of NASA’s earth science data using mature technologies and practices, with the goal of advancing Earth science research through increasing efficiencies for current users and enabling access for new users. The project leadership team includes Co-I Siri Jodha Singh Khalsa from NSIDC, Co-I Christopher Crosby from UNAVCO, and Co-I Helen Fricker from Scripps. Additional SDSC staff supporting the project include Kai Lin, a senior research programmer; and Minh Phan, a software developer. The OpenAltimetry project is funded under NASA ACCESS grant number NNX16AL89A until June 22, 2018.